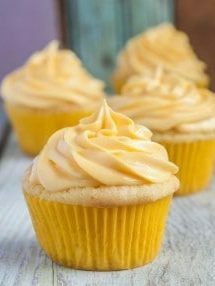 Easy Gluten Free Lemon Cupcakes Recipe! My gluten free Lemon Cupcakes recipe is very easy to make from scratch, you simply add all the ingredients into one bowl and mix it all together! You don’t even need to cream the margarine and sugar or fold in the gluten free flour, it just all goes into one bowl along with the eggs and lemon juice. Once you’ve mixed the batter well (you can do it by hand, it doesn’t need a mixer) you are ready to add it to the cupcake pan. When you make your frosting you want to make sure you sift the powdered sugar, it can be a bit tricky to get the lumps out otherwise. I’ve found that dairy free margarine in frosting gets soft much more quickly than butter so use your own judgement regarding adding in milk, you may not need it if you think its soft enough. I usually keep the cupcakes in the fridge after they are frosted, I’m sure I’m breaking baking rules on that but there’s no way the frosting will stay solid in my Mississippi house year round! So this is not the only cupcake recipe I have! Before you go make sure you check out my most recent Gluten Free Chocolate Cupcake Recipe, it’s another really easy recipe that’s perfect for those of you who are new to gluten free baking. My Gluten Free Apple Pie Cupcakes with Caramel topping are very decadent, perfect for birthday parties. And lastly if you’re looking for an easy to make layer Cake then this fabulous Gluten-Free Lemon Cake from Gluten Free Palate would go down a treat, it looks delicious! 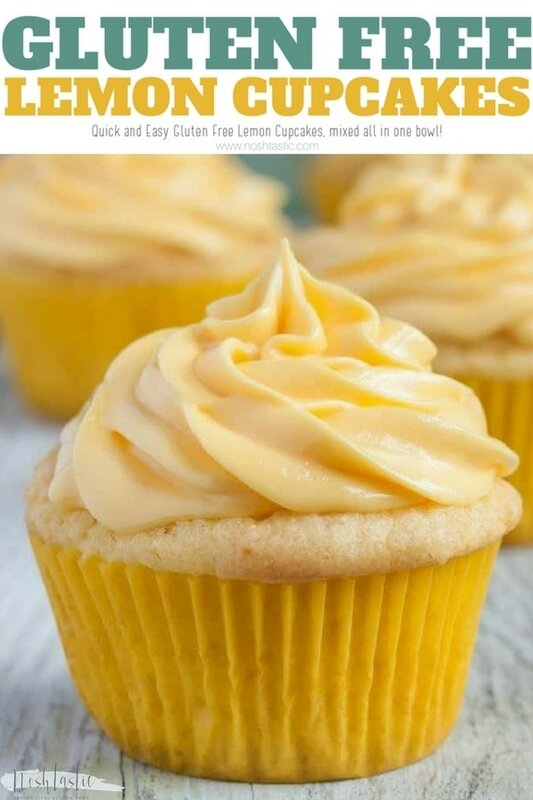 Really easy lemon cupcakes you can make from scratch at home! Add all purpose gluten free flour, xanthan gum, baking powder, margarine, sugar, eggs, lemon juice, and lemon zest to your mixing bowl. line a cupcake baking tin with cupcake wrappers. This mix will make 9 - 12 cupcakes, it depends how much you fill the cupcake wrappers. Spoon about a tablespoon of the cupcake mixture into each cupcake wrapper. Bake for 18-20 mins on the middle rack in the oven, until cakes are fully cooked. Allow them to cool on baking rack. 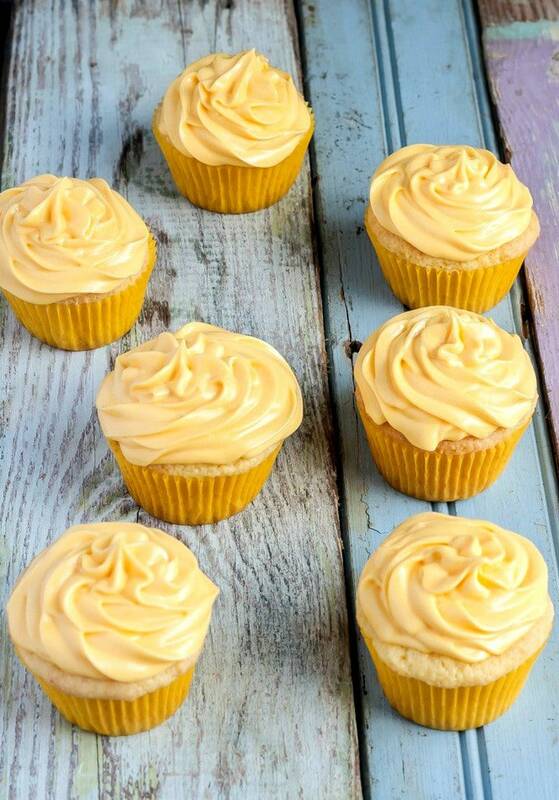 While cakes are baking make your frosting by mixing together powdered sugar, margarine, lemon juice. Add in some milk if you need to make the frosting thinner. When cakes are fully cooled, pipe or spoon on the frosting, I used a wilton large star tip to pipe the frosting. 1. I bake by weight using a digital kitchen scale as I find that gives the most consistent results, especially when baking gluten free. One cup of your gluten free flour blend may not weigh the same as my blend. 2.I recognise that most Americans are used to the cup method which is why I also include those measurements, but they may not give you accurate results as they are approximate only. If you are a keen gluten free baker I would encourage you to invest in a digital kitchen scale. 3. I prefer to use my own homemade gluten free flour blend as it's cheaper and I get really great results. 4. If you can, avoid buying flour with gums already added. The reason for this is that you have no way of knowing how much gum is in there and that can alter the outcome of the recipe. So for example, too much gum can give you a more sticky texture in a cupcake. And though the cupcake recipe will still work, it won’t be as nice as if you measured and added the gum yourself. Hi, these look amazing! I am wondering if you have considered or tried using coconut oil in place of margarine? Hi Angel, I have baked some with coconut oil so it might be worth a try, but I’ve not done it for this recipe. I think if the oil is melted when you mix it in, the texture of the cake may be different as you are adding in more liquid, but that’s just a guess. If a recipe (like a muffin) asks for melted oil I often use coconut oil and not margarine. I would love to be able to use butter but I can’t eat it anymore. My daughter and I are baking a cake today for a contest and I asked her if she wanted to do something lemon, but then I realized that I don’t have any good gluten-free recipes. I may be the only one at the party who needs it to be GF but I still want some! I like your style. I am excited to try this. Hi Danielle, I hope the party goes well and cupcakes turn out nicely for you! Found this the other day on Pinterest and it was a major hit at the office, thank you!! I am just curious – will 1 Tblsp of cake batter be enough to make a full size cupcake? These cupcakes look fabulous!!!!! I am definitely trying them…..just wondered about the amount of batter per cup. The batter tasted really good but they fell in while baking! Baked them for 18 minutes. I did add a little extra lemon juice because the batter did not seem to be coming together for me. I am not a gluten-free baker so I am learning here. Would the extra lemon juice have made them fall in? Hi Anne, I’m so sorry they collapsed for you, that’s annoying when it happens! The additional lemon juice may have caused the batter to be too thin, I guess it depends how much extra you added. There are a couple of reasons for cakes collapsing and I’m not sure what could be causing it for you so I’ll share what I know 🙂 The first one to check is if you used a ready made flour blend that has gum listed in the ingredients (xanthan or guar gum) did you add more gum to it? I don’t know if it will cause the cupcake to collapse but too much gum can alter the outcome of the recipe. Here are some more reasons for cake collapse: overfilling the cupcake liners, baking at a higher altitude, not baking for long enough,opening the oven door to check them halfway through – don’t do it! overbeating the batter (adds lots of air), oven temp too high can cause a rapid rise then collapse, using too old baking powder and they won’t rise properly (check if it still fizzes when added to water) I hope that helps! Thanks Sheena! I did use a pre-mixed gluten-free flour with gum but I did not add extra. I may have over-filled but I had enough batter to mak 9. I did beat them for a while because, as I said, the batter did not initially come together for me so that may have done it. The batter was still pretty stiff despite the extra lemon juice. I’m going to try them agai until I get them right. What came out of the oven, despite the collapse, was extremely tasty!! As my sister is a recently diagnosed celiac, I’m trying to learn to make stuff that she can enjoy as well so…..practice makes perfect, right! Thanks for responding so quickly! Much appreciated. I’ve got to admit, I was skeptical about these cupcakes right up until I cooked one off and tasted it. These are really quite good! I made a batch to go with some boxed (and I never do boxed but I needed to save time) as a GF option for some guests and these were miles better than the boxed o es! I o my wish I hadn’t played around with a baking sugar substitute, but that’s on me. Hi Karen! Glad to hear they worked out for you! I’ve never tried baking sugar substitutes, they may be more tricky to bake with as you discovered but I know lots of bakers who like them. What kind of flour mix is good to use in this recipe? Do you make your own or buy already made? I’m looking for a gluten free flour recipe good for cakes and cup cakes. Hi Dawn, I typically make my own blend as I’ve found that it is almost always better than store bought. I have a post here that details how to make your own blend with the gluten free flours you can find locally, sometimes I can’t always find the ones I want but that’s ok as long as you can work with the proportions in the recipe post you can change them up very easily. These cupcakes are really delicious!!! So easy to make and they make huge quantities. Perfect for birthday party. And they keep for a couple of days too. Thank you!!! Just made these with roasted poppy seeds. And, instead of a lemon-flavored frosting, I made a vanilla-flavored frosting. The two flavors mixed together are absolutely delicious! I will definitely use this recipe in the future. Probably next week, since my father will eat them all tomorrow! Did I.miss.an.ingredient? I didn’t get a batter at first but a lumpy mess. I added almondmilk until it looked like a normal cake batter and the turned out good but just wondering where the liquid is. I’m not sure exactly what you’re asking when you ask where the liquid is? Do you mean in the cake batter? This recipe does not have any additional liquid in the cake batter other than the eggs and lemon juice, I don’t have almond milk in my recipe. Did you substitute any ingredients? If you missed an ingredient then yes, that would affect the outcome of the recipe, but I’m not able to know what ingredient you might have missed. Could you use grass-fed butter in place of the dairy free margarine? Has anyone done that with success? Thanks! you sure could use any butter in place of the margarine 🙂 At the time I made the recipe I was not able to tolerate butter in any form, but the recipe will work with either butter or margarine.